A lot of fun was had in Class 7 today. First we had playtime with Class 4, 5 and 8 followed by exercise together. Next was writing and it is great to see all of the children writing the alphabet neater and correctly. 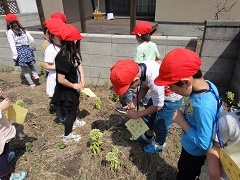 We got a letter from our Class 4 friend the Vegetable King. 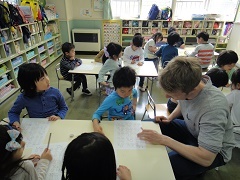 He challenged the children to go to Kitakaze park to find signs of spring. We could find flowers such as crocus and tulips. We could also find insects such as spiders and ants. After we came back to the Kindergarten we could see the Koinobori that the senior classes had made. The Koinobori was put on a flag pole and raised into the sky. 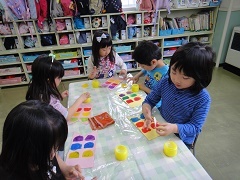 The children really enjoyed their lunches and after lunch we could finish off our own Koinobori craft. The children are excited to have more fun next week!